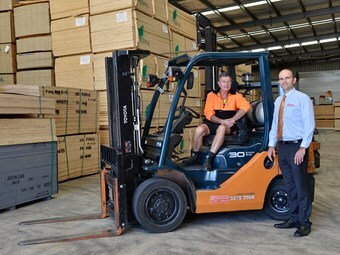 A 3-tonne-payload Toyota 8FG30 forklift is paying its way at a southern Queensland timber panel supplier by lifting double panel packs and boosting productivity. International Panels' Toyota 8FG30 forklift. Loganholme-based International Panels principal Peter Wintour says the wholesaler also runs a 2.5-tonne payload Toyota 8FG25 forklift. "A double pack weighs 2.8 or 2.9 tonnes, so the three-tonner is lifting near to capacity every day, day in day out. We definitely work them hard," he says. "Both Toyota forklifts have been absolutely brilliant. We're so happy with them that we're thinking of buying another one." The 8FG30 is a combustion counterbalanced model powered by a 2.5-litre Toyota 4Y 1DZ-II diesel engine rated at 40kW, or a 3.5-litre 2Z model pumping out 49kW. It measures 1,240mm wide and 2,170mm high (to the overhead guard height) and has a turning radius of 2,430mm. Toyota Material Handling describes its 8-Series range of 1-3 tonne counterbalance forklifts as "Australia's favourite engine-powered forklift model", based on AITA statistics as at December 2014. Safety features of the range include Toyota's System of Active Stability (SAS) and Operator Presence Sensing (OPS) as standard features. "Toyota SAS monitors key forklift operations, detecting and counteracting instability to help reduce the risk of tip-overs," Toyota says. 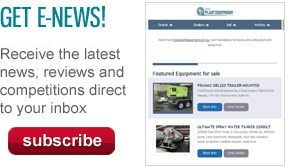 "The Operator Presence Sensing (OPS) system helps to prevent accidental movement of the forklift and forks when the operator is not seated at the controls," it says. "The OPS system senses if the operator is properly seated and at the controls by means of the seat switch. "When the operator is properly seated at the controls the seat switch will go on. If the operator is not seated at the controls the seat switch will turn off and the OPS system will disable the ability to lower the forks, or tilt forward or back along with all the other loading and unloading movements." Also featured are an Active Control Rear Stabiliser, which helps to reduce lateral tip-overs by locking the rear axle when it senses instability, and an Active Mast Function Controller which senses and reacts to instability by limiting mast angle and speed according to the load's height and weight.